CAPT John “Coach” Havlik, U.S. Navy SEAL (Retired), led special operations teams around the world during his 31-year naval career, to include the Naval Special Warfare Development Group, the SEAL’s most elite operational unit. CAPT Havlik was a nationally-ranked swimmer, and is a member of the West Virginia University Sports Hall of Fame and Mountaineer Legends Society, WVU's Ring of Honor equivalent. Born in Munich, Germany, Coach grew up an Army brat, following his father around the world, eventually spending most of his childhood in Glen Burnie, MD. Coach enlisted in the Navy in 1982, and was subsequently assigned to the United States Naval Academy as a swim coach/physical education instructor upon completion of Boot Camp. He was commissioned as a naval officer via Officer Candidate School in November 1984. Coach successfully completed Basic Underwater Demolition/SEAL (BUD/S) training in 1985. His military assignments have included a full range of duties in Sea, Air, Land (SEAL) Teams, Special Boat Teams, and Naval Special Warfare Development Group. He commanded several times and completed numerous deployments to named and contingency operations around the world, to include one deployment to Iraq, where he oversaw the complete redeployment of all Special Operations forces and equipment from Iraq after ten years of combat operations. Coach's naval career included overseas assignments in the Philippines, Panama and Bahrain. He has worked extensively with inter-agency and international partners. John Havlik, who swam at WVU from 1977-80, became WVU’s first United States Olympic Swimming Trials qualifier in 1980 and three-time NCAA swimming qualifier from 1978-80. A native of Glen Burnie, Maryland, Havlik helped the Mountaineers to a 31-6 record during his career. In 1980, Havlik was co-captain and led the Mountaineers to a 9-0 mark, the school’s first-ever undefeated, untied season. A four-year letterwinner and three-time team MVP, Havlik was an eight-time school record holder during his four years (200-, 500- and 1,000-yard freestyle events, 400-yard individual medley, 100- and 200-yard butterfly events and member of the 400-yard medley relay and 800-yard freestyle relay). John Havlik left school as the WVU Natatorium record holder in three events: 500-yard freestyle, 200-yard butterfly and 400-yard individual medley. He was selected as the Most Outstanding Swimmer for the 1979 and 1980 Eastern Intercollegiate Swimming & Diving Championships – the first swimmer in WVU history, male or female, ever selected for that award. He was a six-time Eastern Intercollegiate swimming champion. He was chosen to attend the 1979 Olympic Development Swimming Camp, and was a four-time qualifier to the AAU Indoor and Outdoor National Swimming Championships. Havlik won the 1979-80 WVU Athletic Council award, honoring the senior WVU athlete for athletic performance, sportsmanship, dedication and academic achievement. 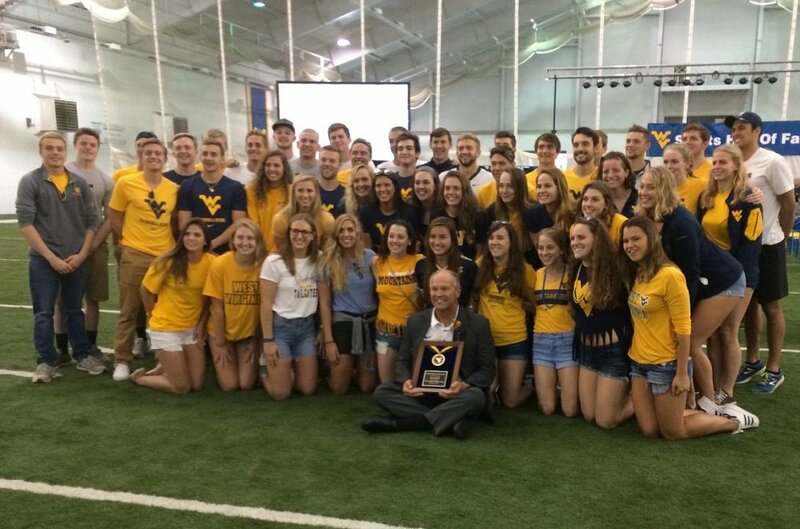 In 2017, Havlik was inducted into WVU Sports Hall of Fame.